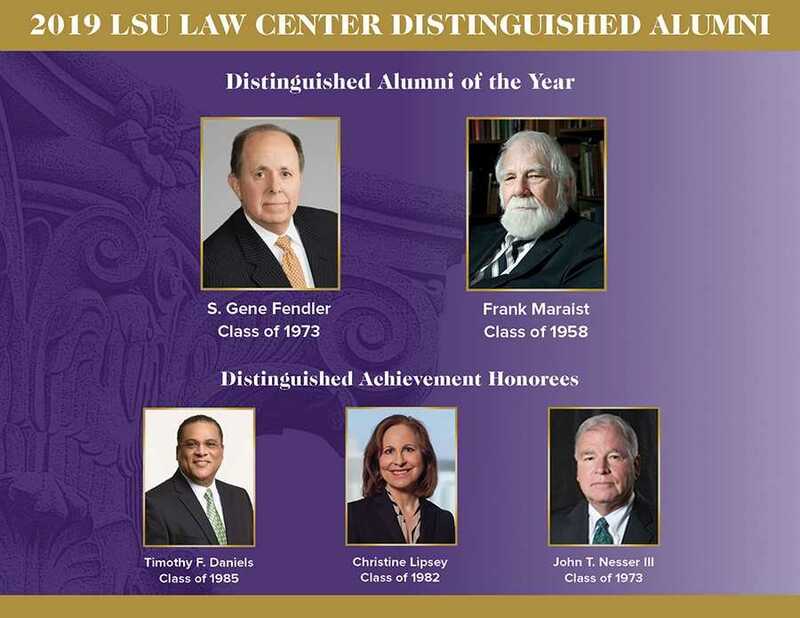 The LSU Paul M. Hebert Law Center has selected S. Gene Fendler and Frank L. Maraist as the 2019 Distinguished Alumni of the Year. Timothy F. Daniels, Christine Lipsey, and John T. Nesser III have been named the Distinguished Achievement honorees. The five LSU Law alumni will be honored at a ceremony on Friday, March 22, 2019, at the InterContinental New Orleans. LSU Law Center’s Distinguished Alumna/us Award is given annually to alumni for rare distinction in professional achievement and loyalty to the LSU Law Center. The Distinguished Achievement awards recognize graduates for professional achievement and career distinction, service to and support of LSU Law, and service to the community. S. Gene Fendler, the LSU Law Alumni Board of Trustees President, was first appointed a member of the LSU Law Alumni Board of Trustees in fall 2005. He was named President in spring 2010. He is a 1973 graduate of LSU Law Center and a former member of the Louisiana Law Review. He often appears as a guest lecturer at the Law Center. Fendler is a trial and appellate lawyer with more than 35 years of experience in both casualty and business matters. He is former president and managing partner of Liskow and Lewis in New Orleans, serving in that role from 2003 until 2009. Prior to joining Liskow and Lewis, he served as a law clerk to the Honorable Alvin B. Rubin, District Judge, United States District Court for the Eastern District of Louisiana. He has tried over 75 lawsuits to verdict or judgment in state and federal courts throughout Louisiana as well as Texas, Illinois and Massachusetts, and has served as lead trial counsel in mass tort and class action matters. Fendler was instrumental in the Liskow and Lewis gift establishing the Liskow and Lewis Visiting Lecture Series at the Law Center, and he has been a long-standing member of the Chancellor’s/Dean’s Council. Frank Maraist earned his B.A. in 1951 from the Southwestern Louisiana Institute, and his J.D. from LSU Law in 1958. He went on to earn an LL.M. in 1969 from Yale University. He taught classes in Evidence, Torts, Admiralty, and Advanced Torts Litigation. He was a Member of a Supreme Court committee to study financial assistance to clients; frequent speaker at programs for lawyers and judges, faculty director of the LSU CLE program; and a prolific author on Louisiana torts, evidence, civil procedure, and maritime law. He authored 23 books and many more articles. Professor Maraist’s monthly newsletter covering developments in Louisiana law was anxiously awaited and immediately read by Louisiana attorneys. He taught at the law schools of Mississippi, Texas, North Carolina, Tulane, and Washington in St. Louis. He was the longest-serving executive director of the Louisiana Judicial College, which is an arm of the Louisiana Supreme Court that provides continuing legal education to the state’s judges. He also was the first executive director of the Louisiana Association of Defense Counsel, one of the four largest state organizations in the nation providing continuing legal education for defense attorneys. Professor Maraist also served on the faculty of the National Judicial College. Timothy F. Daniels (Class of 1985) is a member of the Irwin Fritchie Law firm in New Orleans. He is a faithful advocate for the LSU Law Center, serving on the Board of Trustees for many years, and also providing leadership for the Law Center’s Annual Fund from 2014-15 and again as chair from 2015-16.. He has been a member of the Chancellor’s/Dean’s Council for many years. Daniels has taught in the Law Center’s Apprenticeship Week since its inception. He served as President of the New Orleans Bar Association (2013) and has served on many national, state, and local law-related organizations. He is a recognized trial attorney who has tried multi-million dollar cases through to verdict. Daniels has tried many cases in the 30 years of his legal career, including railroad, products liability, insurance, casualty, and premises liability cases. He has served as lead trial counsel in class action and mass joinder litigation, and as trial counsel in several cases outside of Louisiana. He has an active railroad and pharmaceutical practice. Also, he is Past Vice-President and Board member of Big Brother Big Sisters of Greater New Orleans. Christine Lipsey (Class of 1982) is a member of the commercial litigation team in the McGlinchey Law Firm in Baton Rouge. Lipsey is widely recognized throughout the state and region as a leader in commercial litigation. She extensively presents in the area of legal ethics, and has taught for many years as an adjunct professor at the Law Center, most recently teaching The Legal Profession (ethics and professionalism) and Business Torts. She has published and presented on a number of business litigation topics including consumer credit and privacy, corporate officer and director liability, borrower/lender litigation, and unfair trade practices. She has more than 30 years of experience in litigation representing small and large businesses, insurance companies, state agencies, lenders, and corporate and limited liability company constituents. She was the recipient of the Louisiana Bar Foundation’s Curtis R. Boisfontaine Trial Advocacy Award in 2016. Lipsey has served on numerous legal committees for the ABA, Bar Association for the Fifth Federal Circuit, LA State Bar Association Board of Governors and House of Delegates, the LA Supreme Court, and the Public Defender Board. She is the former President of the Baton Rouge Bar Association. She is a long-standing member of the Chancellor’s/Dean’s Council. She has been active on the LSU Law Board of Trustees for many years. John T. Nesser III (Class of 1973) retired as executive vice president and chief operating officer of McDermott International, Inc. in 2011. He joined McDermott, a global energy engineering, procurement, construction and installation company, as associate general counsel in 1998 and spent over ten years in various senior management roles, including as general counsel, chief administrative officer and chief legal officer. Since his retirement from McDermott in July 2013, Nesser has served as the co-founder, manager, co-chief executive officer and director of All Coast, LLC (“All Coast”), and he has also been a Board member for Thermon Group Holdings. Following its acquisition of Hercules Offshore Domestic Liftboat Fleet in July 2013, All Coast owns and operates one of the largest fleets of liftboats for the offshore oil and gas market in the Gulf of Mexico. Previously, he served as a managing partner of Nesser, King & LeBlanc in the New Orleans law firm, which he co-founded in 1985. He has been an active member of the Board of Trustees for many years, and a constant supporter of the Law Center’s Chancellor’s Council/Dean’s Council, as well as making one of the largest gifts in the Law Center’s history to establish an endowed chair in energy law. For ticket information, contact Christine Briede at 225-578-8343 or cbriede@lsu.edu.